Can You Juice Raw Potatoes? A bag full of potatoes. 4 Can You Juice Raw Potatoes? Greasy chips and French fries don't do your body any favors. Raw, plain potatoes, though, can wipe out blackheads and gift you with glowing skin. You don't need fancy salon treatments to clear up acne -- a potato mask gets the job done while infusing your skin with vitamins and minerals. If you'd rather not slather your face with potato, try drinking the vegetable instead. Blend potatoes with a few tomatoes and basil for a juice that cleanses from the inside out. Cut one large raw potato into small chunks using a sharp knife. Run the potato chunks over a grater to make a thick pulp. Transfer the potato pulp to a large bowl. Slice a medium-sized onion in half. Grate one half of the onion and transfer the pulp to the bowl. Mash the onion and potato pulp together well with a fork or spoon. Apply a piece of clean gauze to the skin you want to treat. Smooth the vegetable pulp over the gauze. Let the mask set for about 10 minutes, then rinse well with lukewarm water. Blot skin dry with a clean towel. 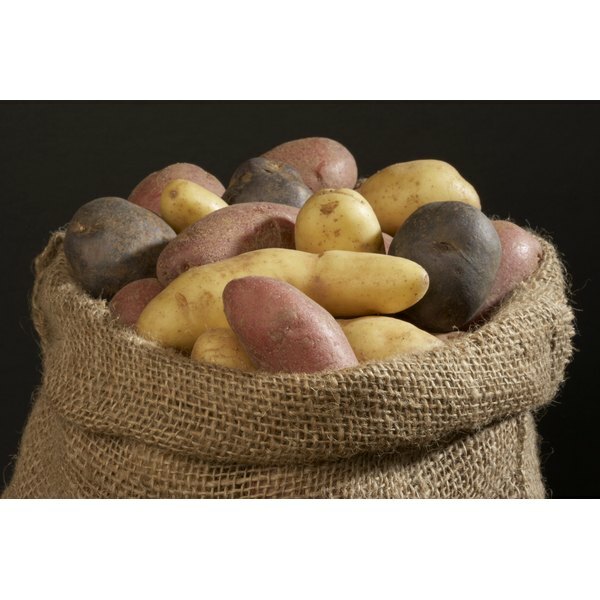 Wash 1 pound of potatoes and 1 pound of tomatoes well under running water to remove any dirt. Cut the vegetables into small chunks, then put them in a blender. Add six basil leaves to the blender. If desired, add a pinch of parsley for taste. Blend the ingredients together on a low speed until smooth. Drink the vegetable juice. Store leftovers in a covered container in the refrigerator. The juice should stay fresh for a few days. Other fruits and vegetables can treat acne, too. For example, try making an antioxidant-rich berry mask. Puree four or five blueberries with two medium-sized strawberries in a blender or food processor, then smooth the paste over oily skin. Pureed spinach and applesauce work, too.